Centre for Public Interest Litigation (CPIL) today submitted its stand before the Supreme Court, following the confusion that ensued regarding its working, after certain submissions made before the Court on January 12 were allegedly ‘misreported’ by the media. The submissions on behalf of CPIL today were signed by five senior lawyers, Mr. Anil Divan, Mr. Shanti Bhushan, Mr. Colin Gonsalves, Ms. Kamini Jaiswal and Mr. Prashant Bhushan. CPIL informed the Court that in view of the “confusion created due to wrong reporting”, Mr. Fali S. Nariman has resigned from CPIL. Following this, a resolution was passed at an urgent meeting of CPIL’s governing body on January 15, 2016, wherein it was decided that the NGO’s stand should be clarified before the Court. It then brought to the Court’s notice, the letter written by Mr. Prashant Bhushan to the Editor of Firstpost. In the letter, Mr. Bhushan had stated that the “incorrect reporting” has caused serious confusion and damage to the reputation of CPIL and himself, and went on to explain CPIL’s stand before the SC. “I had stated that there is a sub-committee of 5 advocates: Mr. Anil Divan, Mr. Shanti Bhushan, Mr. Colin Gonsalves, Ms. Kamini Jaiswal and myself who decides on the PILs to be filed by the society. I had also mentioned the names of certain senior advocates like Mr. Fali S Nariman who are the founding members of CPIL and are also part of its governing body. Your paper has misreported the court proceedings and has stated that Mr. Nariman is part of the committee which decides on filing of PILs. That is not what I had said and it not correct,” he wrote. You may read the entire text of the letter, here. Following this, a clarification had been issued by Mail Today, whose report had been cited by Mr. Nariman in his letter dated January 14, 2016 to the Registrar General, wherein he had clarified that he was not involved in the vetting of PILs filed by CPIL. With this backdrop, CPIL then went on to address the queries concerning its background, the system followed in filing PILs and the scrutiny of the information received. It informed the Court that Mr. Bhushan, with the assistance of his juniors and after discussions with Ms. Kamini Jaiswal, looks into and scrutinizes the materials on which a potential PIL is to be drafted. “The majority of the litigation proposals coming to CPIL are rejected, since it is felt that the material is doubtful, or the matter does not raise a major issue of public importance,” it says. The Court was informed that Mr. Bhushan and at least three of his juniors spend a bulk of their time in scrutinizing PIL proposals and the material which comes with them. CPIL also clarified that in the case at hand, no material had been received from any business rival or competitor. “In not one of the CPIL matters has this Hon’ble Court questioned the bona fides of CPIL. In not even a single CPIL matter has this Court found the petitions of CPIL motivated. In not even one of the cases did the Court find CPIL acting on behalf of a party having a vested interest,” it submitted. It further informed the Court that a sub-committee which decides about issues/cases to be taken up was re-constituted in the meeting of the Governing Body held on May 4, 2003. The sub-committee comprises of Mr. Anil Divan (President of CPIL), Mr. Shanti Bhushan, Mr. Colin Gonsalves, Ms. Kamini Jaiswal (General Secretary of CPIL) and Mr. Prashant Bhushan. With regard to the source of information and documents received, it submitted that offices of Mr. Bhushan and Ms. Jaiswal view documents coming from non-independent sources with great care, but if the information appears credible and shows evidence of serious harm to public interest which needs intervention by the Court, then the same is used in the PIL. “This is done after a dispassionate and objective analysis about its credibility,” it said. The submissions were made in view of a hearing that took place last week, with CPIL having to face some unconventional questions from Chief Justice of India regarding the source of information and scrutiny of it before filing the PILs. The Bench, comprising Chief Justice T.S. Thakur, Justice A.K. Sikri and Justice R. Banumathi apprehended that people with vested interests could misuse the credibility enjoyed by the CPIL in order to settle scores in their business rivalry. “When we entertain your petition, you must establish a credible mechanism of scrutiny. People of eminence should apply mind and certify that such a mechanism inspires confidence. We want to make sure that a petition filed by CPIL has gone through a particular process and is genuine,” it had said. 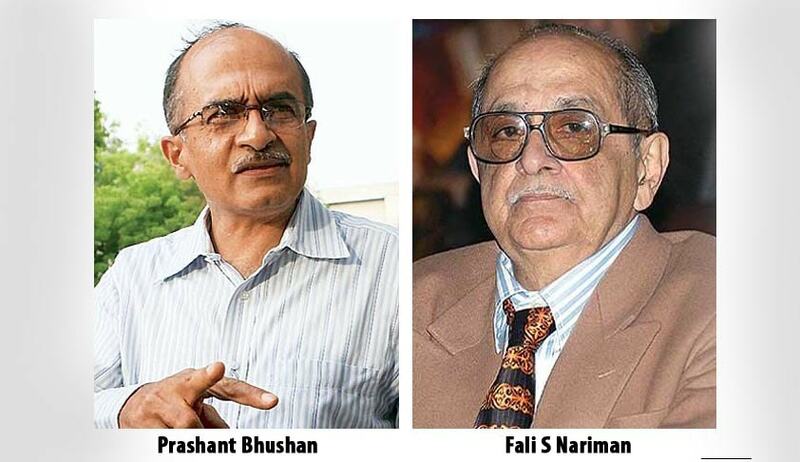 “Prashant Bhushan, you have an image of a crusader. But can you become the centre for public interest litigation? Can the system be taken for a ride in such a manner? We cannot allow this. We must be satisfied that you have a committee which scrutinizes the complaints and allows only genuine ones to be converted into public interest litigations,” the Bench was further quoted as saying. You may read the LiveLaw article here.